Our Easter Celebration began on Thursday with the school Easter program.The entire Elementary performed a couple songs and quoted John 11:25-26.Then the high-schoolers took the stage and did a reading and drama of the crucifixion and resurrection of Christ.They also did a stick dance to the song, “Arise, My Love” which is performed by Newsong.That night, we ate some left over ice cream from one of the classes’ parties (with permission, of course).Actually, it wasn’t JUST ice cream.We feasted on ice cream sundaes! We got home and packed up our bags to be ready for the drive to the coast on Friday morning.We left our home at about 7 AM and headed up to a sweater village called “La Ligua.”Unfortunately, many of the shops were closed due to Good Friday, but we still managed to find a few treasures along the way. For Family Fun Day this past weekend, the school administrator and his wife recruited help to put on a Carnival for the children and their families.It was a privilege to be a part of, and there seemed to be a good turnout.There were different stations for the children to play games at and earn prizes, and there were also stationary fun things like an inflatable slide and a cotton candy machine. My station was a game in which the children had to put a clothespin on their chin and drop it into a bucket below.Depending on the size of the child, the size of the hole was adjusted.The kids did a GREAT job and really seemed to enjoy it! Everyone was asked to bring a snack to pass and then there was an intermission when everyone took a break from games and got some grub. It was an enjoyable time of food and fellowship. Mr. Hagerty shared a devotional and a prayer before the food was fair game. Welll?This week has proven to be full of challenges and successes like the many preceding weeks.One of the great delights of this week was getting to Friday and Student Share Time.What IS Student Share Time?Please, sit down, relax, and let me tell you….. When I started out this semester, I really wanted to encourage the children in speaking the English Language.As I sat thinking about ideas of how I might do this, I asked the question, “What makes ME want to try and talk in Spanish?”Hmph.That’s easy.When I get to talk about something I like or know about…..hmmmm…….and THAT was the beginning of an idea. 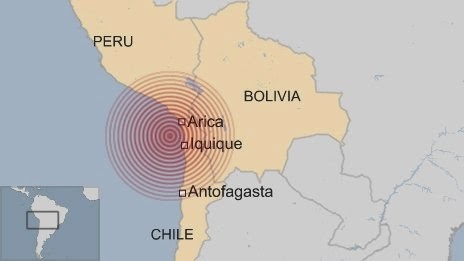 Just a quick note about the earthquake that took place in Chile yesterday. We were about 1,000 miles south of the epicenter of the quake. We didn't feel anything down here in Santiago. Please be in prayer though as we do have some team members serving in Northern Chile where there was power outages, and no water supply. We have heard that they are ok, but from the sounds of it, there is lots of damage! Here's a map to show where the earthquake took place. I (Brian) had the privilege to go on a field trip with some of the high school students.We went to a show called FIDAE.It is an exhibition of aerospace and defense which is held every two years in Chile.This show is the largest in the southern hemisphere and the fifth largest worldwide.It serves as a trading platform and brings companies from across the globe to show-case their aerospace and defense systems/products. I enjoy guns and defense systems, but this place seemed like out of a movie. The hangers were broken up into countries like Israel, Russia, USA, France, Turkey, and more. All the big name companies were there and there were some really cool things to see! Towards the end of the day we were able to see an F-16 start up and take off. It performed many complex manuvers right above us. It was truly an awesome thing to see! !